Earlier this week we had gone to Target to get some drapes for Meg's room. While there we picked up a mirror for the back of her door. (Every girl needs a full length mirror, right?) There was not a green one so we got the turquoise one thinking it would be alright because it matched her bedding. Well, today I had to take my dad to physical therapy and Kade tagged along. We went to a different Target to pick up a few needed things. 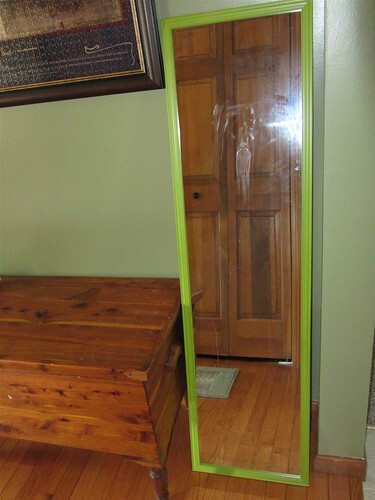 There we found the green mirror so I got it for Meg's room. Or at least to give her another option. On the way out of the store Kade said he hoped Meg wanted the turquoise one so he could have the green one. And I thought What does he need a mirror for? (Now here is the part of the story that if I was really paying attention I would have walked back into the store and bought another green mirror, but I didn't.) And that was all he could talk about while we drove home. Once at home I showed Meg what I found. Guess which mirror she picked? Yep, the green one. This started the tears running down Kade's face. And it wasn't the silent kind of crying either. I tried to explain to him that I could take the turquoise one back and get another green one but that didn't seem to help. I sent him to his room until he could calm down. The girls happened to be in their rooms playing quietly and didn't like being disturbed so they kept yelling at telling him to stop crying. That didn't help. If anything he got louder. At some point he said he would stop if Meg let him have the green mirror. (So conniving.) She thought about it and was ready to say okay but I was mean put my foot down and said no. He eventually did stop crying. He ended up crying for at least 30 minutes. I don't know if he's going through a phase of some sort or what but Kade cries more now than he ever did as a baby. What's up with that? Does/has anyone have/had a crying six-year-old? Or is it just Kade? Sometimes I think he needs more sleep but I don't think that's the only reason.